This TA Technix sport suspsension kit is for the Ford Mondeo Sedan type B4Y / B5Y from 2000-2007 without Turnier and level control. 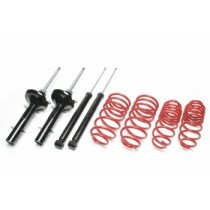 This TA technix sport suspension kit is for the Ford Focus type BWY from 2000-2007 without level control. This TA Technix sport suspension kit is for the Ford Mondeo type BAP / BFP without Turnier, ADS ( automatic variable damping) and level control. This TA Technix sport suspension kit is for the Ford Mondeo Sedan type GBP from 1993-1996 without Turnier, ADS ( automatic variable damping) and level control.